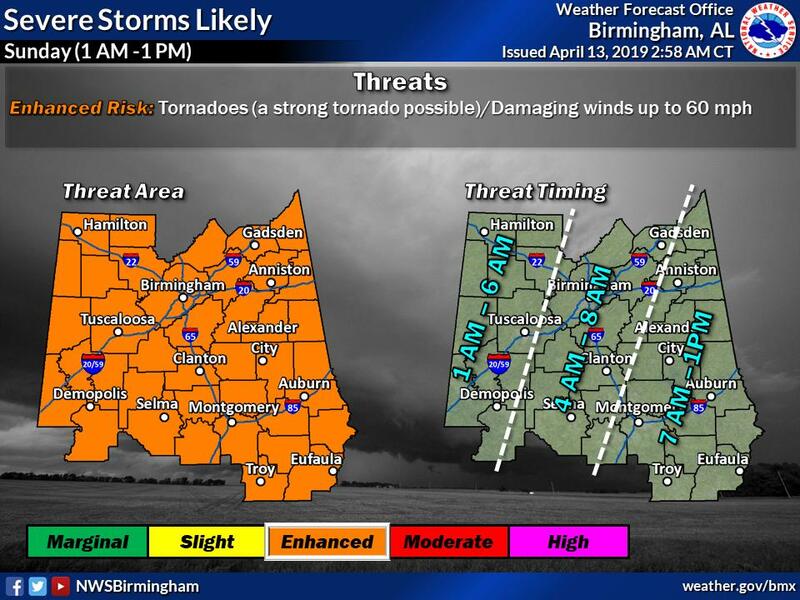 BIRMINGHAM — North Alabama is under an enhanced risk for severe weather from 1 a.m. until 1 p.m. on Sunday. This includes the entire Tribune coverage area. The greatest risk for metro Birmingham is from 4 a.m. Sunday until 8 a.m. However, the timeline is an approximation and everyone should remain weather aware throughout the 12 hour period. According to the National Weather Service in Birmingham, these storms could produce tornadoes and damaging, straight-line winds. Storms will arrive across west Alabama during the early-morning hours on Sunday. The NWS advises that a warning system such as a weather radio be available and operating, as well as a plan for moving to a safe place in the event of a tornado warning.